The Podgorze section of Krakow was eventually transformed into a Jewish Ghetto at the onset of World War II and later in 1942 was the location of the infamous Plaszow Concentration Camp. At its peak the Plaszow camp incarcerated 25,000 inmates at one time. In total, over three years of its existence, roughly 150,000 people suffered imprisonment here under hellish conditions mostly Jews of Krakow. More than 80,000 of the Plaszow inmates died before the end of World War II, most in the gas chambers of Auschwitz and Birkenau. The camp was shut down in January of 1945. He was the brother of the Chechoiver Rebbe of Eretz Yisroel Reb Abisch Kanner. 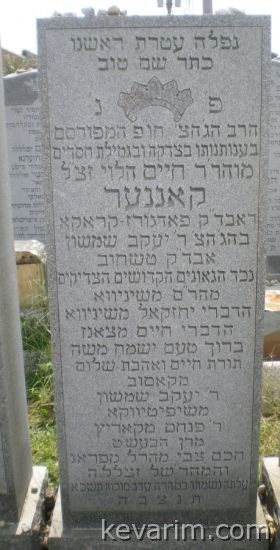 His father wasthe SIL of Reb Moishele Shinever the son of the Divrie Yecezkel. The Rav never had any children, he also had a brother in EY who is buried in Tverya. That would make him a nephew of Rebbe Dovid Halberstam the Sokolover Rebbe (buried in Union Field). Are you sure his name isnt Kanner? I know poeple named Kanner, never seen Canner. You are right, he is indeed a nephew of the Sokolover Rebbe. Azi is probably right about the spelling. BTW he had another brother Rebbe Baruch Kanner who lived here in the East-side, he is buried in Eretz Yisroel. Canner or Kanner that?s question????? R’ Chaim Kanner had a daughter, Rachel, who was married after the war to R’ Menahse Yaakov Levertov, himself a Dayan and Rav in and around Krakow. It was the persistence and savvy of this daughter that saved the family during the war thru exile in Russia, Siberia, and too many places to mention here. HaRav Levertov was a survivor of Plaszow and served briefly as Chief Rabbi of Krakow after the war until they came to New York. The Levertovs had 2 daughters, Rebecca and Channa. Harav Levertov tragically died after being struck by an automobile while walking home from shul on a Friday night in 1966. He is in the Bobover section of Washington Cemetery in NJ. I am the granddaughter of Rav Chaim Kanner. My mother was Rachel Kanner. The last post above is correct. My grandfather lived in the lower East Side of Manhatten after he immigrated to the US and died on Erev Sukkot in 1960. He was a very philosophical, sweet, gentle man, beloved by children (and even animals). There is a wonderful story my mother used to tell from their Buchara days during the war, when he rescued a goat from being teased by children and then the goat would follow him around whenever it saw him. He was the oldest of 11 children. After WW1 his family left Poland for Romania and he came back to Poland to marry his first cousin, my grandmother. The two mothers, Chaya Channa and Yittah were sisters. I am named after both these greatgrandmothers: Channah Yittah. My grandfather called himself Shinever Rav. Wherever I would run into people who knew him, they spoke of him with great love and admiration, referring to him as a tzaddik. I am told that when giving tzedakkah, if someone approached him, he would stick his hands deeply into his pockets and never count how much he took out and just give it all away. I remember sitting on his lap by the window watching a flock of birds flying by and his telling me a story how the birds were flying to a “chasanah” – a wedding. I could go on; but, I guess I will stop now. Is this discussion still live? I believe I am a Kanner descendant and would like to ask someone with knowledge some questions. Thank you. What are the questions you have about Kanner? Sorry Mr. Kanner but R’ Avraham Abisch Kanner was NOT a son-in-law of the Sanzer Rav. There are Kanner’s who are descendants of the Divrei Chaim, such as R’ Chaim Kanner from above, and the other the children of Rabbi Yakov Shimshon Kanner who was a son-in-law of R’ Moshe of Shiniewa, the grandson of the Divrei Chaim. Also there are also a few Kanner’s between the grandsons of R’ David from Kshanov, the second son of the Divrei Chaim. is not a part of the descendants of Rabbi Yakov Shimshon Kanner. I have all the names of their descendants, between the descendants of the Divrei Chaim of Tsanz, and you also!